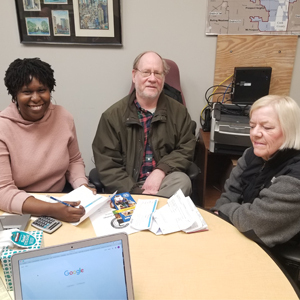 Sustainable Communities Liaison Foluke sits with two consumers to go over their bills at a utility bill clinic. April is a busy month for CUB’s Outreach team: As part of our 35th Anniversary Clean Bill Campaign, we’re aiming to staff at least 500 events in 2019. The campaign’s goal is to clean utility bills of bad deals and wasteful spending, and to educate people about opportunities with clean energy in Illinois. For more events near you, check out CUB’s events calendar.